Sharing a Love of Reading | Kid Reporters' Notebook | Scholastic Inc.
Why are picture books so important? 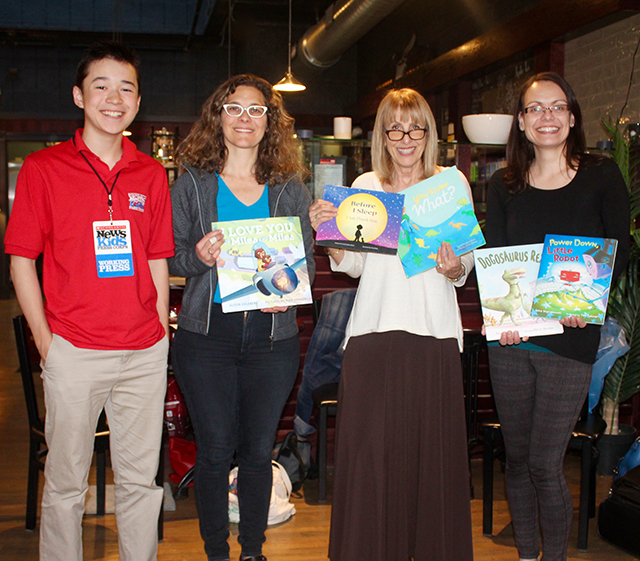 At a recent storytime event at Blue Bunny Books in Dedham, Massachusetts, three authors answered that question. Alison Goldberg (I Love You for Miles and Miles), Carol Gordon Ekster (You Know What? ), and Anna Staniszewski (Power Down, Little Robot), shared bedtime stories, songs, and lots of laughter. The event was part of a book drive hosted by my family’s nonprofit organization, Catching Joy. Why are picture books so important? Carol Gordon Ekster: Picture books are an art form. They touch lives. They can deal with any subject and offer a love of reading. Alison Goldberg: Reading picture books can spark our imaginations. The pairing of text and image supports the development of readers. As a parent, I think about the unique bonding experience of reading picture books with a child on my lap. Anna Staniszewski: My daughter just turned three, and it has been amazing to see her exploring the world both through her personal experiences and through the books we read to her. Picture books give kids a window into so many different types of stories and characters and experiences. Goldberg: One of my favorite books as a child was Alexander and the Wind-Up Mouse by Leo Lionni. I love the collage illustrations. Rereading it as an adult, I’m still drawn to the story’s theme of empathy. Staniszewski: If I had to pick my favorite, it would be Bark, George by Jules Feiffer. It’s so wacky and clever, and it makes me laugh every time. Ekster: The more you read, the better a writer you’ll be. You have to keep working at your craft. You have to be in a critique group and get feedback from others. Revise, revise, revise. Staniszewski: It can be easy to forget about writing when there are so many other things vying for your attention. But if you work on writing a little every day, it will always be a priority.